Meticulously maintained this 5 bedroom, 3.5 bathroom is within the coveted Hiwan Estates neighborhood ideally located for schools, shopping and commuting. Master suite upgrades include; new Jacuzzi tub, granite counter tops with upgraded cabinets, etched shower door and heated tile floors. The kitchen is open to the dining area and has been refreshed with granite kitchen counter tops, island with cooktop, Bosch dishwasher and dual French drawer refrigerator. 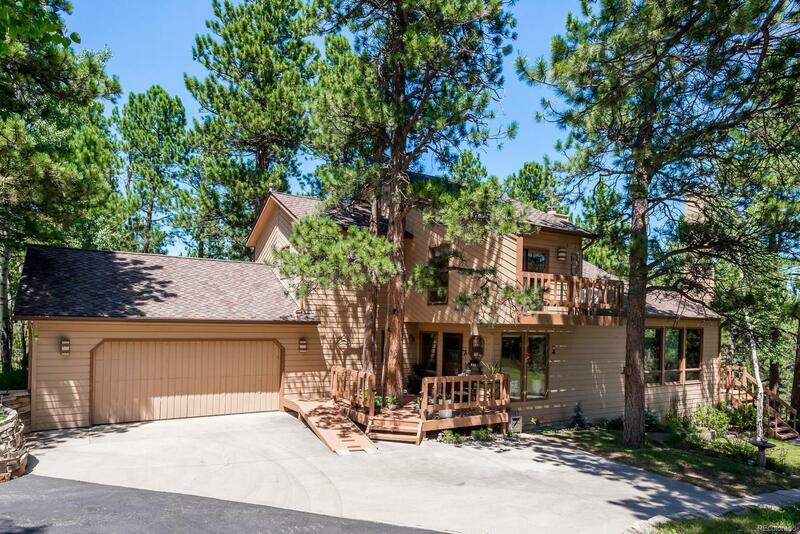 Numerous large windows and skylights allow the Colorado outdoors to be a part of everyday living. The living room and family room share a see through fireplace and exterior access to the entertaining deck in which to view the many elk and deer that visit from time to time. Enjoy the spacious yard for a large play area, gardening or entertaining. Handicapped accessible ramp in front exterior, bedroom and roll-in shower off the laundry room area - easy conversion and many other uses if this is not needed, call agent for details.